Yes I know, this post is ridiculously late on the blog but better late than never ay? Below I provide you with a quick rundown of each month of the 2016/2017 season. Was 4th place good enough? Why do I think Klopp can often be as stubborn as hell? Why did 2017 contain one of the worst matches I have ever watched as a Liverpool fan? Read on to find out. 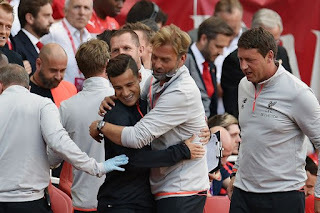 AugustLiverpool kicked off Jurgen Klopp's full season as manager in a game away to Arsenal. The Reds have had some interesting fixtures with Arsene Wenger's side over recent years and this opening tie was no different. Seven goals were scored in the game, four of which came from Liverpool. I was left with a strange sense of disappointment at the result though after I bet 50p on a 4-4 scoreline for a hundred quid haha. The Reds also picked up a draw with Spurs this month but famously were beaten 2-0 by Burnley. A 5-0 win over Burton Albion in the second round of the League Cup completed the month of August.